Lee Maracle, OC (born July 2, 1950) is a Canadian poet and Sto:lo author. She speaks out as a critic of the treatment of indigenous people by the Canadian people and she particularly highlights the issues relating to indigenous women. The granddaughter of Tsleil-Waututh Chief Dan George, Maracle was born in Vancouver, British Columbia, in 1950 and grew up in the neighbouring city of North Vancouver as one of the first aboriginal children to be allowed to attend a normal state school. She dropped out of school and went to California where she did various jobs that included producing films and doing stand-up comedy. She returned to Canada and attended Simon Fraser University. She was one of the first Aboriginal people to be published in the early 1970s. Maracle is one of the most prolific aboriginal authors in Canada and a recognized authority on issues pertaining to aboriginal people and aboriginal literature. She is an award-winning poet, novelist, performance storyteller, scriptwriter, actor and keeper/mythmaker among the Stó:lō people. Maracle was one of the founders of the En’owkin International School of Writing in Penticton, British Columbia and the cultural director of the Centre for Indigenous Theatre in Toronto, Ontario. Maracle has given hundreds of speeches on political, historical, and feminist sociological topics related to native people, and conducted dozens of workshops on personal and cultural reclamation. She has served as a consultant on First Nations’ self-government and has an extensive history in community development. 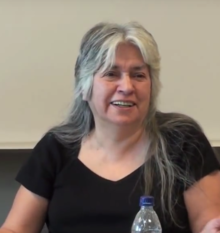 She has been described as "a walking history book" and an international expert on Canadian First Nations culture and history. Her views (as broadcast 18 May 2014 on CBC Radio) are that the Canadian people (not the government, because Canada is an "illegitimate state") should accept responsibility for cultural genocide and the theft of the whole land from its aboriginal inhabitants. Maracle has taught at the University of Toronto, University of Waterloo, Southern Oregon University and has served as professor of Canadian culture at Western Washington University. She currently lives in Toronto, teaching at the University of Toronto First Nations House. She was the writer-in-residence at the University of Guelph. In 2017, Maracle was presented the Bonham Centre Award from The Mark S. Bonham Centre for Sexual Diversity Studies, University of Toronto, for her contributions to the advancement and education of issues around sexual identification. Her newest poetry book, Hope Matters, was written in conjunction with her daughters Columpa Bobb and Tania Carter, and is slated for publication in 2019. Celia's Song. Toronto, ON: Cormorant Books. 2014. ISBN 978-1-77086-416-0. Berry Brill de Ramirez, Susan (1999). Contemporary American Indian literatures & the oral tradition. Tucson: University of Arizona Press. ISBN 9780816519576. Horne, Dee (1999). Contemporary American Indian writing: unsettling literature. New York: Peter Lang. ISBN 9780820442983. Leggatt, Judith (December 2000). "Raven's Plague: pollution and disease in Lee Maracle's "Ravensong"". Mosaic: An Interdisciplinary Critical Journal, special issue: HYGIEIA: Literature and Medicine. University of Manitoba. 33 (4): 163–178. JSTOR 44029714. Lew, Janey (2017). "A politics of meeting: reading intersectional indigenous feminist praxis in Lee Maracle's Sojourners and Sundogs". Frontiers: A Journal of Women Studies. University of Nebraska Press. 38 (1): 225–259. JSTOR 10.5250/fronjwomestud.38.1.0225. MacFarlane, Karen E. (2002), "Storying the borderlands: liminal spaces and narrative strategies in Lee Maracle's Ravensong", in Eigenbrod, Renate; Episkenew, Jo-Ann (eds. ), Creating community: a roundtable on Canadian aboriginal literature, Penticton, British Columbia / Brandon, Manitoba: Theytus Books Bearpaw Pub., pp. 109–123, ISBN 9781894778084. ^ a b c d e "Lee Maracle". The Canadian Encyclopedia. Retrieved 14 April 2016. ^ a b "Lee Manacle". IPL.org. Retrieved 14 April 2016. ^ a b c "Truth & Reconciliation: What's Next?". CBC. 16 May 2014. Retrieved 14 April 2016. ^ "Decolonizing sexuality: U of T recognizes Indigenous educators and advocates for sexual diversity". University of Toronto News. Retrieved 7 July 2017. ^ "20 works of Canadian poetry to check out in spring 2019". CBC Books, January 25, 2019. This page was last edited on 5 February 2019, at 19:40 (UTC).